I talk (or think) about cork all day, everyday. I have for years. Explaining the process of the cork harvest and how the bark immediately begins to re-generate has always made me feel good. 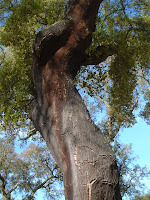 The tree isn't cut down and typically lives a full life of 200-500 years with a new cork bark harvest occurring more-or-less every 9 years. What a fantastic process! A fully sustainable natural material. Why then, over the past few years have people started telling me that we should stop selling cork due to “a shortage” of cork? Over the weekend, at the Green Living Show in Toronto I talked to hundreds of people and time-and-again the question was the same: “isn't cork going extinct?” Some people were outright hostile accusing us of destroying the environment by promoting cork. I was waiting for picket signs to appear asking for a cork boycott. Winemakers started using synthetic corks as well as screw caps in the 1990's. Some of this occurred at a time when there were forest fires in Portugal. 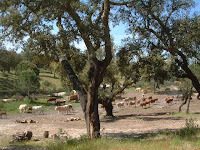 Although forest fires are a natural part of any ecosystem the combination of these two situations propagated a myth that there was a cork shortage. It is my belief that winemakers initially began using synthetic wine corks to reduce the incidence of cork taste that occasionally occurs in wines. Curiously, there have been studies that show that cork taint is still occurring despite the use of synthetic stoppers and screw caps. That means that it's coming from elsewhere. As consumer acceptance of synthetic stoppers began to take hold, winemakers decided to take it a step further and add product cost reduction to the mix. Screw caps became a household reality. Screw caps are made from a metal top and plastic liner – a very synthetic alternative to a natural product. I find this ironic since most other industries are at least attempting to use more natural product packaging. Before 1990, nearly every wine bottle was closed with real cork. Since the innovation of the wine bottle real cork has been used to close billions of bottles of wine. Yet now, despite society's awareness of threats to the environment, we are rejecting nature. As winemakers continue to embrace synthetic closures and screw caps the myth of a cork shortage or extinction continues to be propagated. Cork forests continue to be vibrant but face a threat. The solution to this threat is to use products made from cork. By using cork you are helping to preserve a most diverse and important habitat and making the world a better place in which to live. Permission to reprint provided the author is credited and notified.